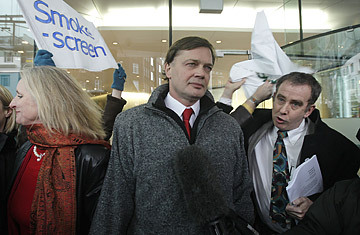 British Doctor Andrew Wakefield (c) was found to have brought the medical profession into disrepute by the General Medical Council in London. In 1998, Andrew Wakefield, a gastroenterologist at London's Royal Free Hospital, published a study in the prestigious medical journal Lancet that linked the triple Measles, Mumps and Rubella (MMR) vaccine with autism and bowel disorders in children. The study  and Wakefield's subsequent public statements that parents should refuse the vaccines  sparked a public health panic that led vaccination rates in Britain to plunge. Wakefield's study has since been discredited, and the MMR vaccine deemed to be safe. But now medical authorities in the U.K. have also ruled that the manner in which Wakefield carried out his research was unethical. In a ruling on Jan. 28, The General Medical Council, which registers and regulates doctors in the U.K., ruled that Wakefield acted "dishonestly and irresponsibly" during his research and with "callous disregard" for the children involved in his study. The General Medical Council, which will now decide whether to revoke Wakefield's medical license, highlighted several areas where Wakefield acted against the interest of the children involved in the 1998 study. It criticized Wakefield for carrying out invasive tests, such as colonoscopies and spinal taps, without due regard for how the children involved might be affected. It also cited Wakefield's method of gathering blood samples  he paid children at his son's birthday party $8 to give blood  and said that Wakefield displayed a "callous disregard for the distress and pain the children might suffer." The panel's ruling follows a refutation of Wakefield's research from the scientific community. Ten of 13 authors in the Lancet study have since renounced the study's conclusions. The Lancet has said it should not have published the study in the first place, and various other studies have failed to corroborate Wakefield's hypothesis. Despite this, the effects of the media frenzy surrounding Wakefield's research  a study found that MMR was the most written about science topic in the U.K. in 2002  continue to be felt in Britain. Vaccination rates among toddlers plummeted from over 90% in the mid-1990s to below 70% in some places by 2003. Following this drop, Britain saw an increase in measles cases at a time when the disease had been all but eradicated in many developed countries. In 1998, there were just 56 cases of the disease in England and Wales; by 2008 there were 1,370. Despite assurances from various health bodies that Wakefield's study was seriously flawed, he still has a dedicated following among parents concerned about a rise in autism rates in the U.K. and U.S.  the cause of which has so far baffled health experts. Wakefield is now the Executive Director of the Thoughtful House autism center in Texas, which the Times of London recently claimed receives millions of dollars in donations each year. At the ruling in London, Wakefield was flanked by a small group of supporters, some of whom shouted in protest as the ruling was read out. Speaking after the hearing, Wakefield remained unbowed, and addressed his supporters directly: "It remains finally for me to thank parents whose loyalty has been extraordinary, and I want to reassure them that the science will continue in earnest."